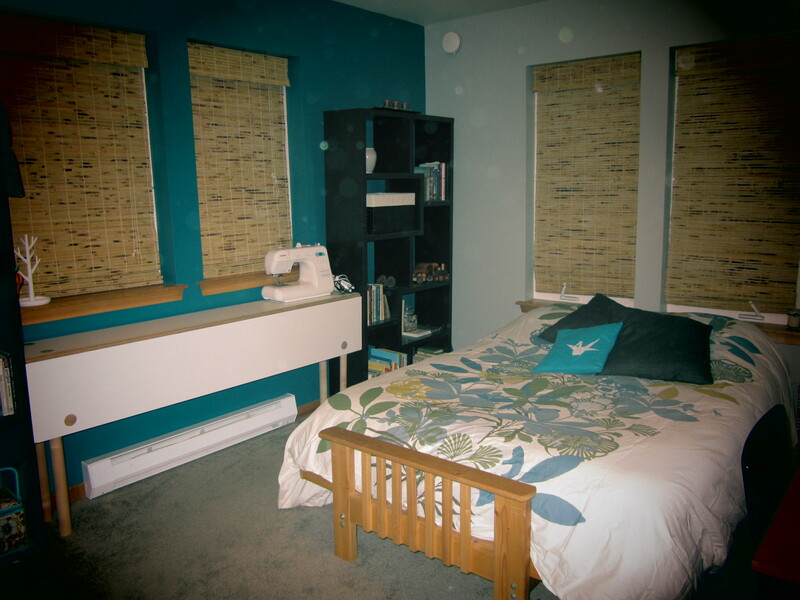 I’m really lucky to have a room that I can use most of the time for sewing & crafts – though it does still need to be used as a guest room occasionally. As I’m working to set-up the room, my biggest dream was to get the largest table possible into the space. It’s not a huge room, so I knew I couldn’t have something that would always be full-sized. 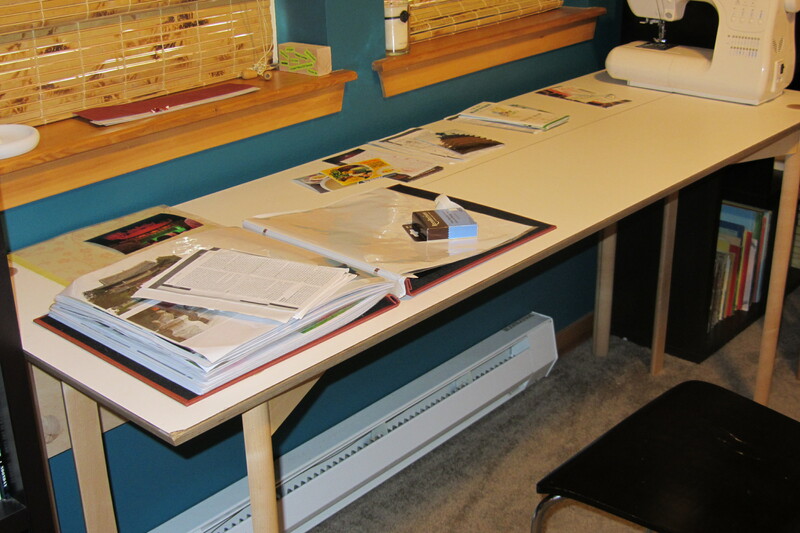 There are a lot of folding tables out there, but most are ugly and many would need to be carried in and out of the room which isn’t ideal. 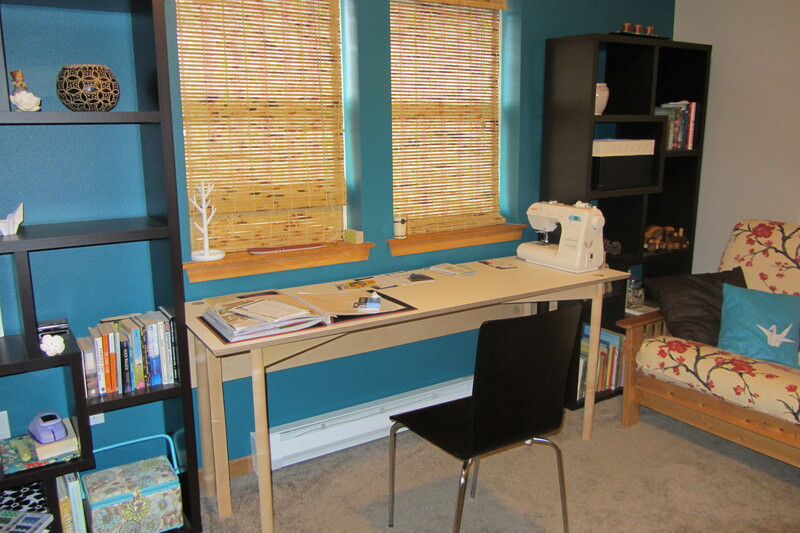 My very talented & creative brother-in-law designed and built me my dream craft table. It’s a simple, clean modern look that I love and is also perfectly functional. The table is six feet long and can be one, two or three feet deep. Most of the time I leave it with one leaf open, which is about two feet deep and perfect for most projects. So far, I’ve used it to spread out photos to finally finish a three year old album from a trip to Asia and I’ve used it to piece, cut and pin together sewing projects. 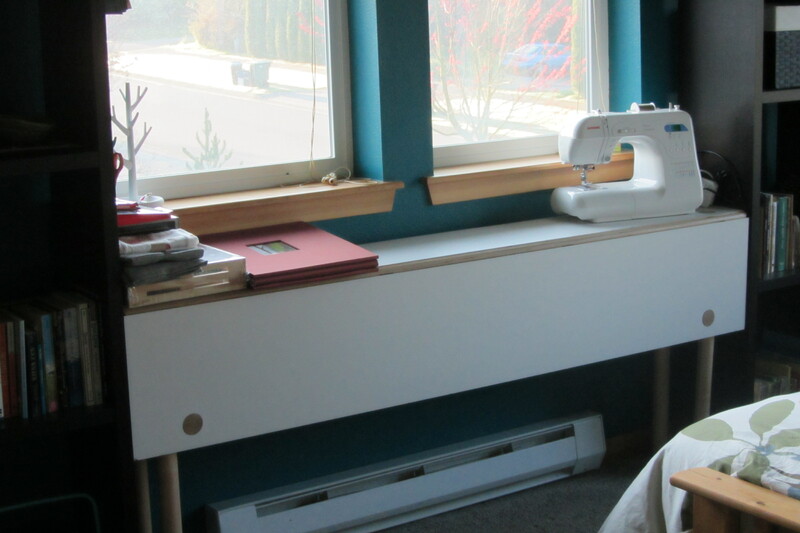 And the best part is, when it’s time for company I just fold down the front leaf and it tucks in-line with the bookshelves leaving plenty of room to set-up the guest bed. Paper crafting has always been my favorite, but I’ve put it on hold for awhile now in favor of sewing. But thanks to inspiration from a friend sewing together a super cute paper garland for a party, I’ve been tossing around ideas in my head for sewing on paper. 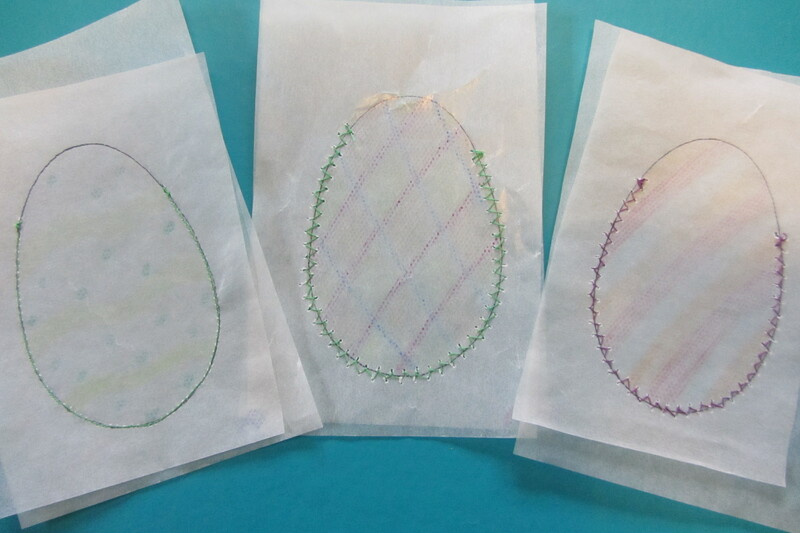 An Easter invitation provided the spark… a friend invited a few of us over for dinner and an egg hunt, encouraging creativity (nothing like pressure since it’s a crafty crowd). 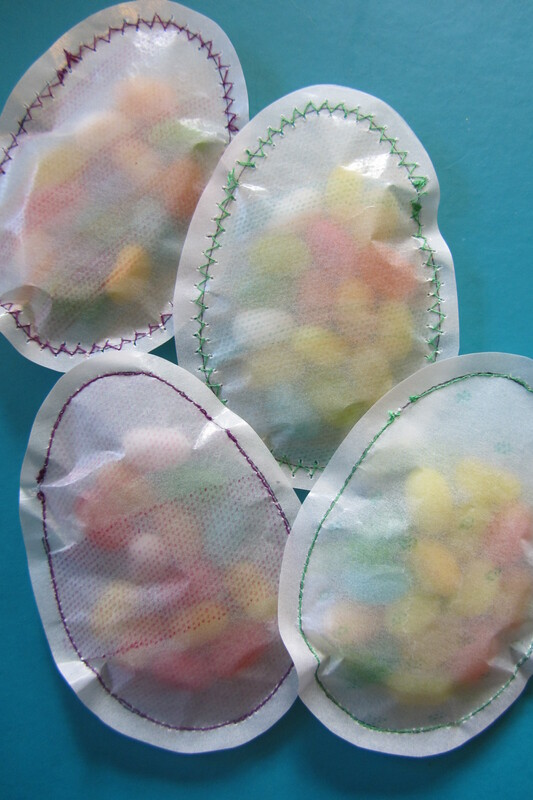 I knew I didn’t want to hard boil eggs or use plastic ones if I could help it and came up with the idea of sewing together paper eggs to fill with candy. I bought a sheet of glassine and got to work. 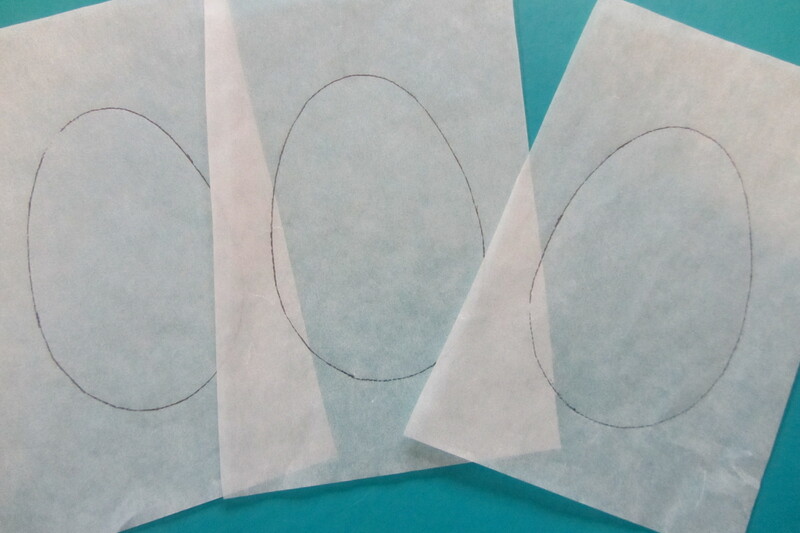 First I traced a bunch of egg shapes and cut them out (leaving lots of extra room around the actual egg shape). Then I whipped out the crayons – the eggs had to be decorated after all. Something else may have worked better since on the waxy glassine, the crayon was pretty faint, but it’s what I had on hand so I went with it. 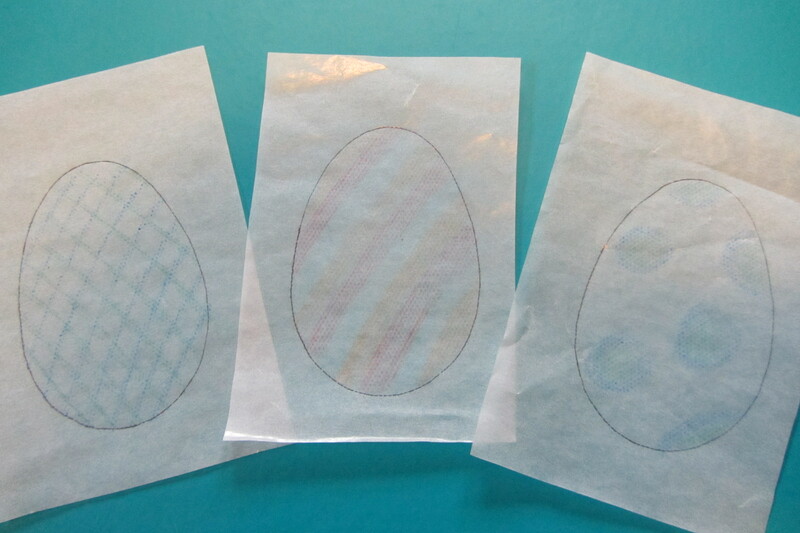 I did leave half the eggs blank for the backs. I paired up the eggs and sewed them together, leaving about the top 1/4 open. I mixed up thread color, and did some with a straight stitch and some zig-zag. Initially I liked the zig-zag better, but ended up like the straight stitch best on the finished product. 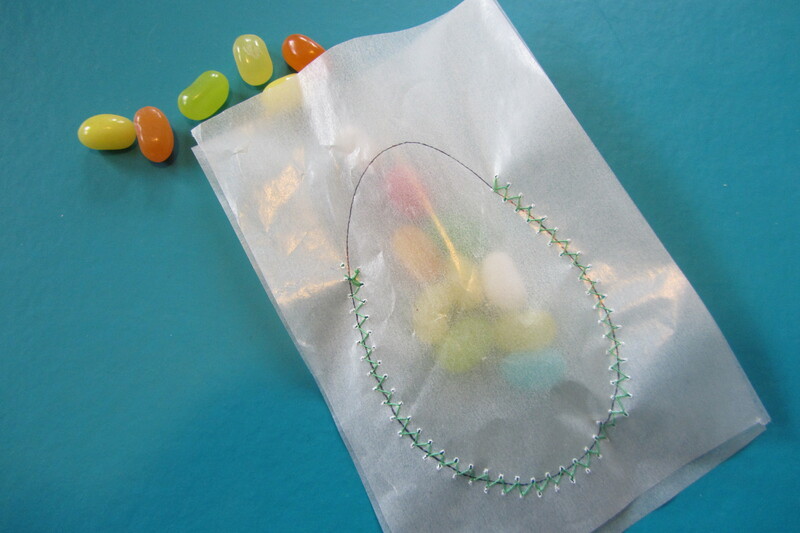 Then I filled them with jelly beans! Time to sew them closed… I left a small gap between the top & bottom section of stitching so there would be a natural place to rip them open. Can’t make it hard to get to the candy after all… Then I trimmed off the excess paper, leaving about a 1/4 inch of glassine outside the stitches. Yup, it works! 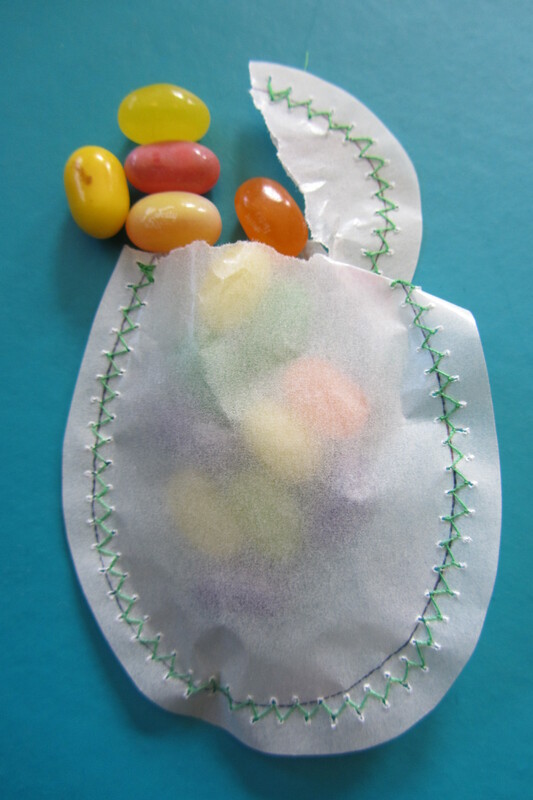 Super cute & fun to make – a new Easter tradition. 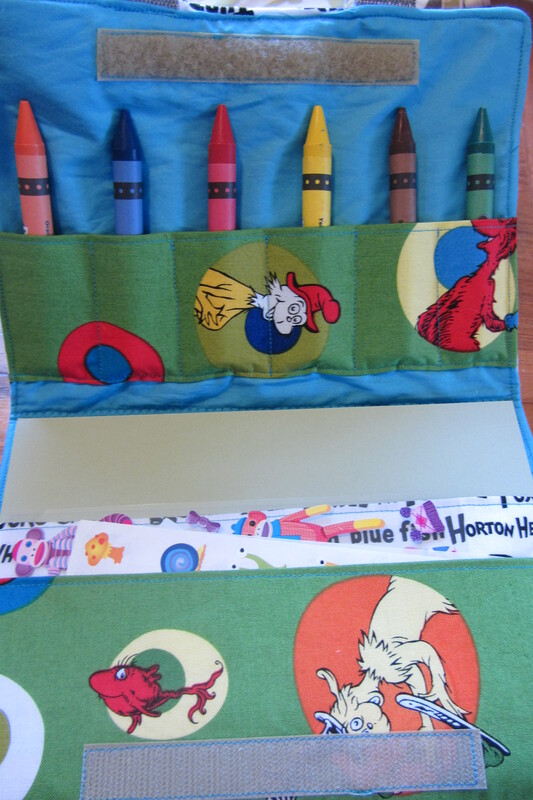 A few months ago, I found this super cute crayon folio pattern from gingercake. I have plans to make it using laminated cotton, but I decided to try it last week with regular cotton fabric. I was visiting a friend and their new baby and being an older sibling, I knew I wanted to bring a gift for the older brother as well. 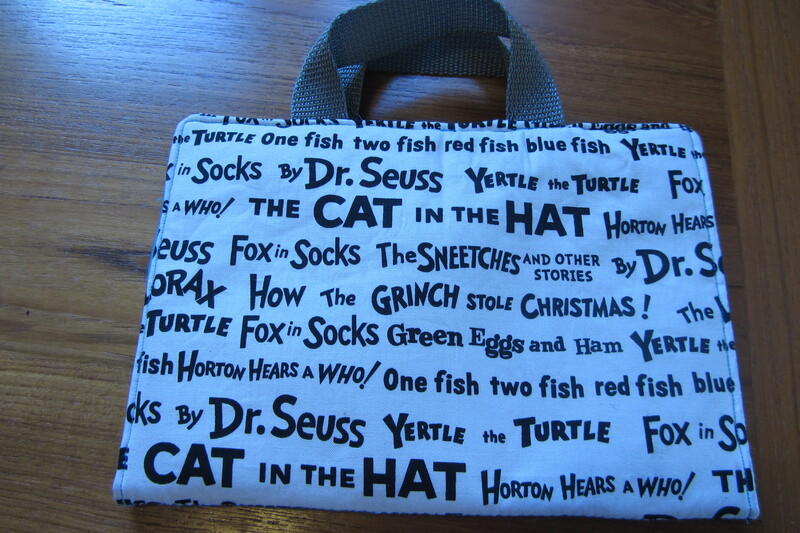 I had enough leftover fabric from my nephew’s Dr. Seuss tent to finally test this project. I’ve got to say, this may just be my go to gift for toddlers and kids – it’s SO cute and really pretty easy (I made it in two evenings). 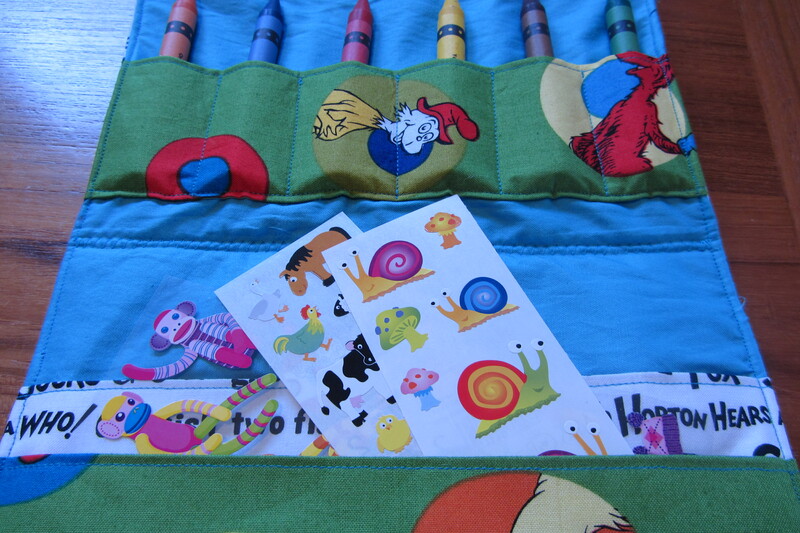 Plus buying the fun stickers, crayons or other crafts to go inside is fun too. I love that it looks kind of like a little briefcase. 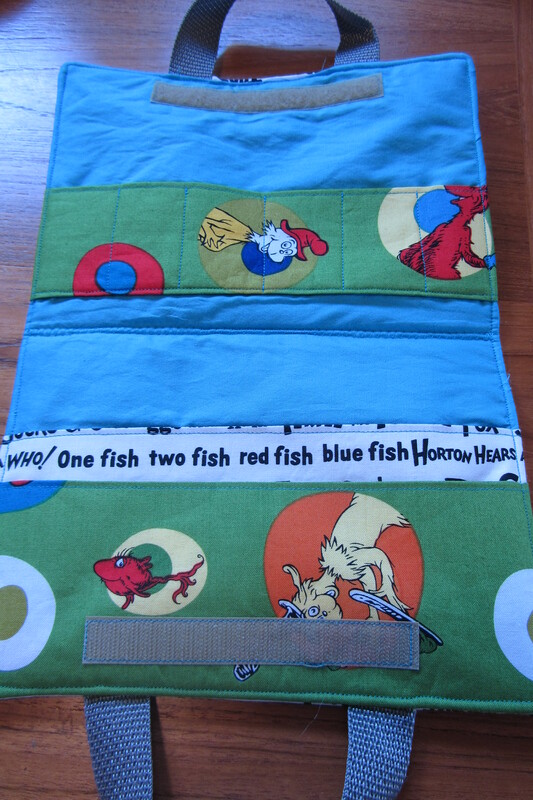 Here’s the inside – this cute Seuss fabric makes everything even more fun, I’m happy I got to use it again. 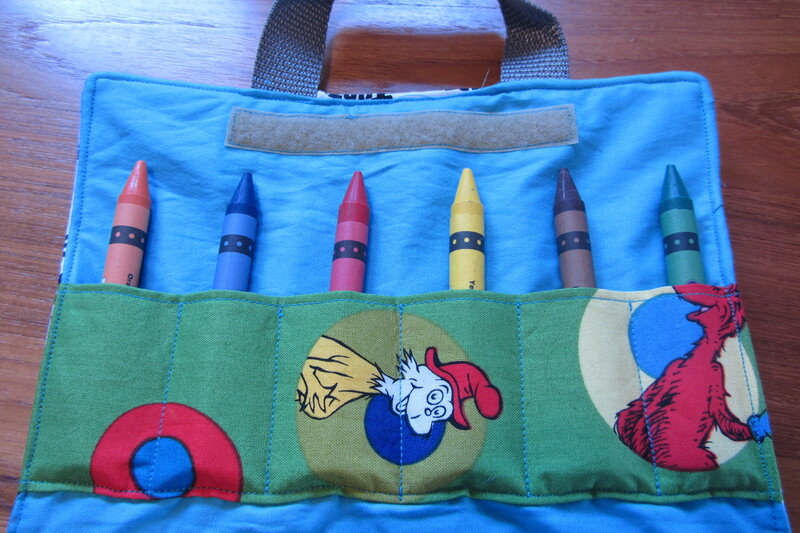 Pockets for crayons and stickers. And just like that, a portable coloring station!